Now available following Hurricane Maria - villa is freshly painted and better than ever! 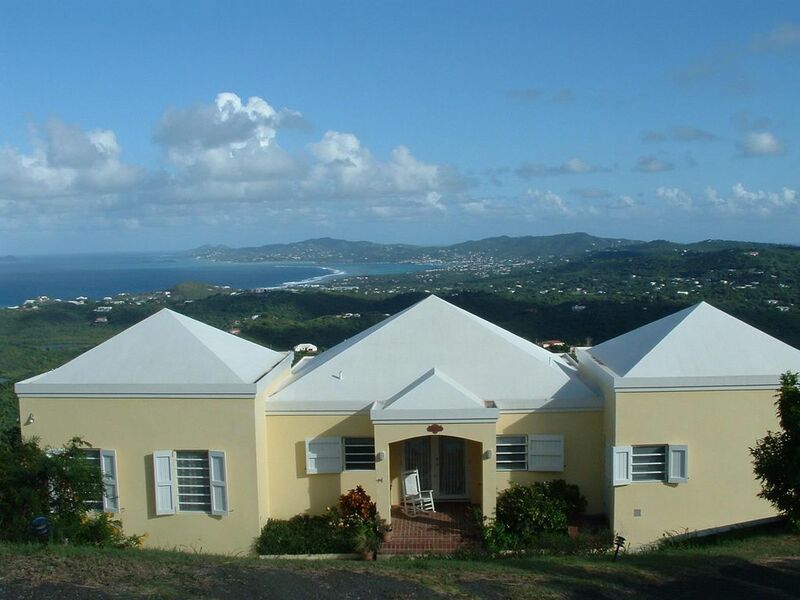 Nestled high on a ridge top along scenic road on St Croix's prestigious North Shore sits Brimstage Estate, named after a quaint country village located in the Northwest of England (the owners parents are the Lord and Lady of the Manor Brimstage.) The 3 bedroom/2.5 bath villa offers 180 degree views of St Croix that stretch from the North to South shore and include; the US and British Virgin Islands, Salt River, Buck Island, Green Cay, and Christiansted. Ideally situated facing east this charming Caribbean villa takes full advantage of the constant trade winds. The main villa consists of an open living/dining room, kitchen, master bedroom and bath, and half bath. There are 20 foot open beamed ceilings and lovely ceramic floors throughout. Step through the double French doors out onto the wraparound arched gallery that has an outdoor dining table and sitting area as well as shaded hammock. Just off the main patio besides the pool, outdoor kitchen and hot tub is the separate Caribbean themed guest sleeping quarters with a large private deck. The two bedrooms have separate entrances and share a common bathroom. One of the bedrooms has a queen size bed and the other has two queen size beds. Below the guest sleeping quarters is the office with its own deck and is equipped with broadband internet, copy/fax machine, coffeemaker, sink, and microwave. New for 2016. A 40k generator. So you will always have power at the villa.